1 cup mung lentils , cooked until soft. Put the eggplants and pepper in a microwave-safe container and cook for five minutes on high for about 5 minutes or until the eggplant is tender. Heat oil in a saucepan. Add the mustard seeds and when they crackle add the onion and saute for about 2 minutes. Add the ginger and stir. Add tomatoes and cook until they start to break up. Add the cooked vegetables, moong dal, and rasam powder. Stir thoroughly. Cook on medium heat for about 10 minutes until the flavors merge and the vegetables are very tender. Add salt to taste. 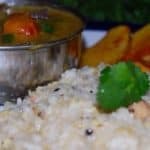 Serve hot with the Vegan Venn Pongal.